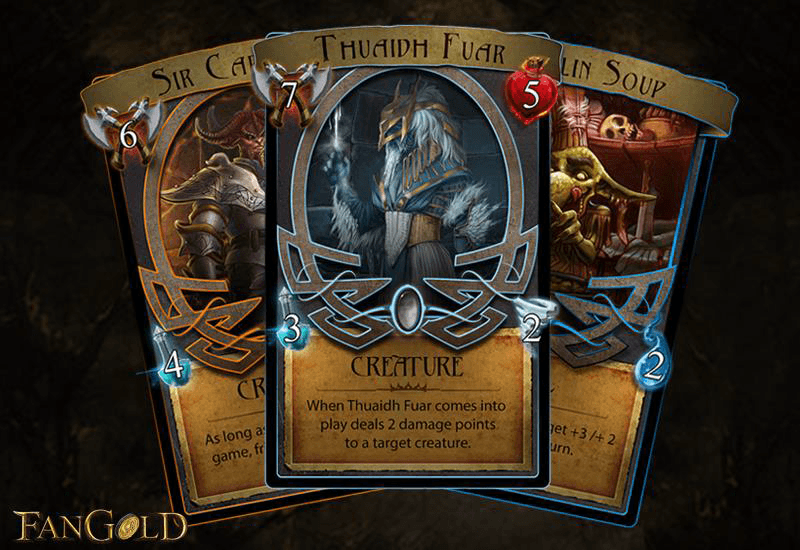 Fangold is the new collectible card multiplatform game, digital free-to-play made in Potato Killer Studios arriving on Windows®, Macintosh®, Linux®, Android® and iOS®. Fangold will be entirely set in the world of Land of Britain, the innovative fantasy MMORPG already presented in the recent months. Fangold gleans liberally from the creatures that inhabit Land of Britain, in order to allow players to begin to become familiar with the MMORPG characters and to know the stories and legends that characterize them. The Fangold deck of cards will consist of 40 cards and will present defensive, offensive cards and cards of illusions, magics, counter-attacks and so on. Of course, there will be special cards and some will have mechanics never seen before in TCGs, but, above all, there will be several ways to use the same card giving it different effects. Nowadays, one of the most serious limitations that characterize TCGs is the impossibility of being able to act during the turn of the opponent; for this reason there will be cards that will give a way to the players to defend themselves and to perform various actions that will give them some advantage. There are also cards that will change the playing field, changing for a one or more turn the ground element in order to strengthen or weaken the creatures. Players can accumulate their cards and increase their deck in many ways – the easier it is undoubtedly the acquisition of new cards with the special pack, but you can also craft them amassing the materials in the game or participating at the Dungeon Raids and with other ways that will be revealed later. The tournaments will be an integral part of Fangold. These will offer rewards and special prizes that will enrich the player deck. In addition, there will be different types of Achivements and there will be the chance to use some cards in Group/Guild, in order to create a community that can evolve and grows together. Fangold will be periodically updated with expansions and new sets of cards. It will also offer the possibility of finding some special cards within a certain period of time or, alternatively, they will be available in limited quantities. The project will be officially launched on Kickstarter soon.